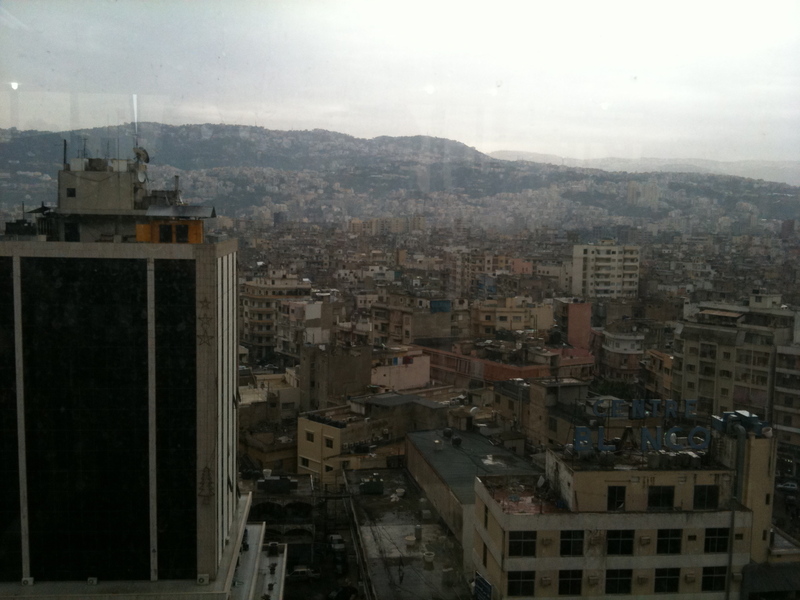 For the 16 months that I lived in Lebanon, I was totally carless. In fact, I didn’t sit behind the wheel of a car for that entire period. Luckily, there were many transportation options for the car-free in Beirut. The servees, or shared taxi, was my preferred option when I first arrived. It was a lot cheaper than paying for a private taxi ride, though you had to share the cramped back seat of a beat up old car with two other people who were, quite often, smoking. During the hot and humid summer weather, this could be unbearable. Still, it seemed the most efficient way of getting around town on a researcher’s budget. After a while, though, I started to grow tired of the routine. Stand on the side of the road, wait for a car to drive by, tell the driver your destination, and he’d either take you or leave you standing on the side of the road. Rain or shine. Some routes were too far for servees, so you’d end up having to change cars at least once. This was really annoying, especially when the weather was bad. At some point I got so fed up with waiting on the side of the road, I decided to decipher Beirut’s bus system. It turns out, it’s a lot easier than expected. There are no bus schedules or maps, nor is there a website with this information (the very notion of a website with a bus schedule was hilarious to anyone I asked). At some point the Beirut street atlas so popular with foreigners and tourists, Zawarib, published a map of the Beirut buses that seemed inspired by the London underground map. While the names of popular roundabouts and destinations were noted on the map (Fiat, the car dealership, for example, or Cola, the busy transport hub for all destinations to the south of the city), it was nearly impossible to determine which streets the bus took, or the distances between the destinations. The best way to learn about the bus was to simply ask bus drivers who have an encyclopedic knowledge of the city and all the numerous private, semi-private bus and microbus services and all their destinations. After I learned the few bus routes that I needed to use the most, I was hooked. Taking the bus was so easy, and so cheap. I rarely felt as cramped as I did in a servees, never had any creepy conversations with the driver, and no doubt in my mind that the bus would pick me up and take me to my predictable destination. With servees drivers, I can’t tell you how many times I had to bargain, pay double or triple, or agree to be taken nearby but not exactly to my destination. Once, a driver left me on the side of a deserted road in an industrial area at 10PM because I refused to allow him to seat an additional 5 guys in the car. He figured he’d rather have the 5 fares than take me home as promised, so he told me I could either sit on someone’s lap or get out. Luckily another driver passed by before too long and agreed to drop me off on the highway – 20 minutes walk away from my destination – because he was in a hurry to get home. After such experiences, I was really sick of the unpredictability of the servees, even though most of the time it was perfectly fine. Even though the bus was incredibly slow, taking nearly twice or three times as long as a servees ride would, it was reliable. 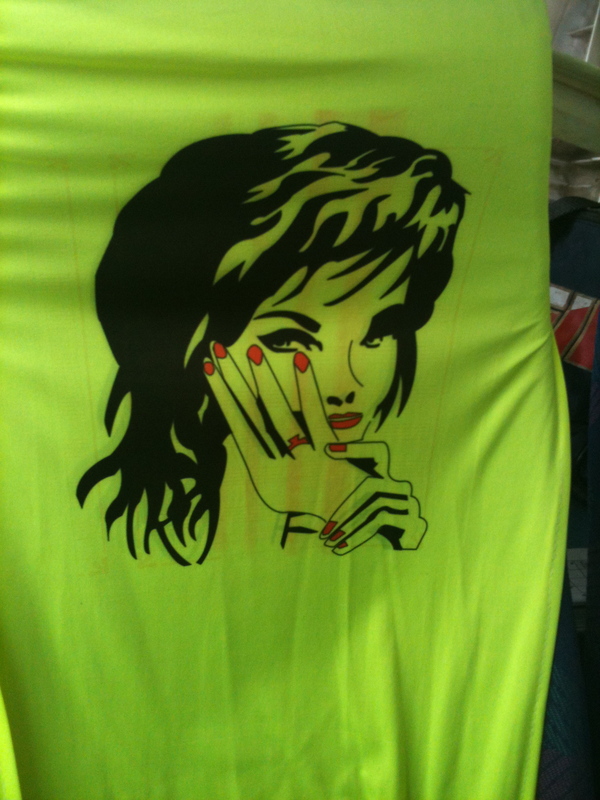 For a woman navigating the city on her own, I also felt it was much safer. The bus provided a bit more privacy than the servees. Taxi drivers always wanted to talk. Unless you had a really good poker face and didn’t reply to any of his questions, you were inviting all kinds of questions, from the inane, to the totally inappropriate. Regardless of your skills in conversational Arabic, if he detected any hint of an accent, he would seize upon that moment to ask where you were from, and the rest of your life story. I learned to be quite rude thanks to my time in servees taxis! On the bus, none of this was necessary. You could just sit and stare out the window. No one would talk to you. The driver might light a cigarette or put on the radio, but he was all the way up in the front of the bus. It hardly mattered anyway, what with the fact that you didn’t have to entertain a series of increasingly personal, intrusive questions. 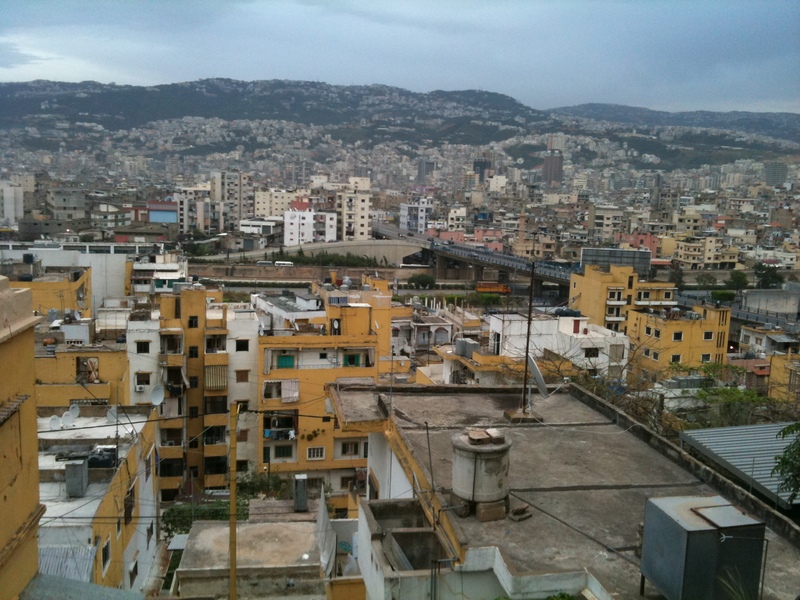 Being in a private car was much more comfortable, but I couldn’t stand to drive in the chaos of Beirut, so for me, the bus was the second best option. It took me hours to get anywhere, but I wasn’t in a hurry, and it suited me just fine. 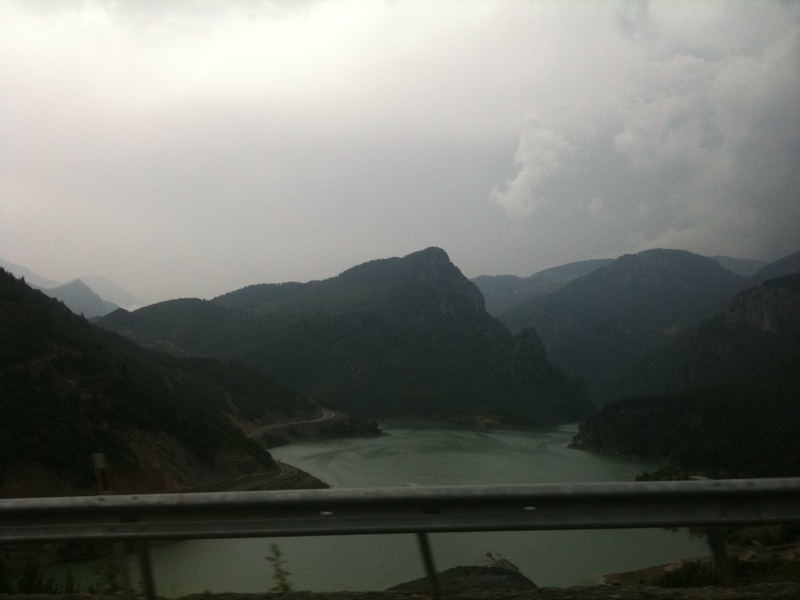 During the summer of 2011, I decided to take a trip around some not-so-close towns in Turkey with a good friend. After cramming for a week to polish my long-forgotten elementary level Turkish, I was just barely able to get around our destinations with the help of a dictionary from time-to-time. My friend wanted to see the lovely cities of Antakya and Gaziantep. I also wanted to go to Adana, Kozan and Seimbeyli, some rather un-touristy destinations. We flew into Adana from Istanbul, the passenger beside me thought us a real curiosity, saying that he rarely sees tourists in Adana. Indeed, Adana was a somewhat industrial, large city that didn’t have much in the way of tourism, either foreign tourists or even Turkish travelers. Our basic hotel seemed to cater more to business travelers. My reasons for wanting to start in Adana, and insisting on going to the smaller, less frequented towns of Kozan and Seimbeyli, had more to do with a curiosity about my family history than planning a relaxing holiday. Both my great-grandparents were born during the time of the Ottoman Empire in Hadjin, now called Seimbeyli. My great-grandmother’s family owned farmland in Sis, the town now called Kozan. That town was also the seat of an old Cilician Armenian empire which fell in 1375, and there were some ruins of the Armenian Church and castle I wanted to see there. While many Armenians conduct “heritage tours” through Turkey, visiting all the sites of old Armenian churches and castles, or towns where Armenians used to represent either a majority or a large minority, I didn’t want to take a package tour. I thought it would be more fun to take local buses and talk to people (as much as my limited vocabulary would allow me to). Our trip was short, less than a week, so we ended up having to take a series of long bus trips between these cities, every day or so. The first day was grueling. 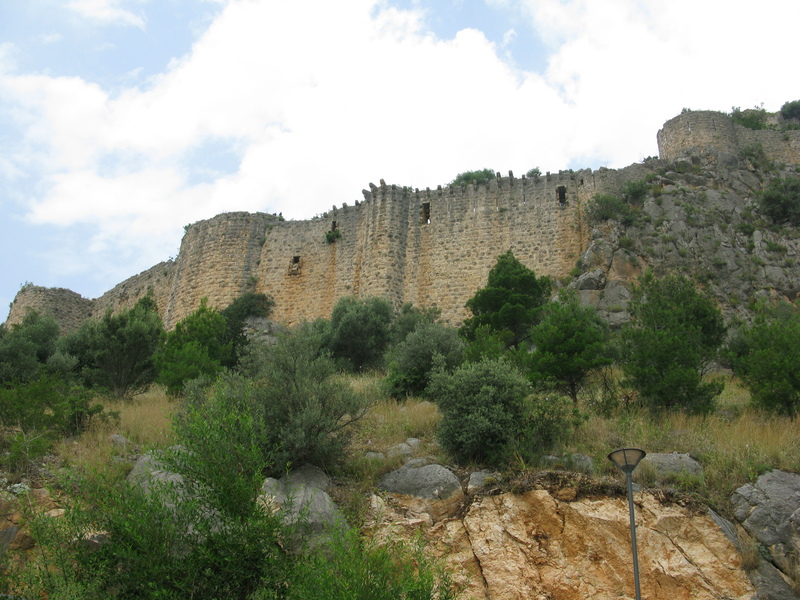 We took a 2 hour bus ride up to Kozan, hiking up to the enormous ruins of the old castle of “Sis” in the warm July heat. We made our way to the local bus station and asked for the next bus to Seimbeyli. Somehow there was a miscommunication, or a deliberate obfuscation of facts, and the bus ride we thought would take 2 or 3 hours, took 4 hours. Seimbeyli was definitely off the beaten track. We drove up and up and up into heavily wooded mountains with dramatic peaks that looked like something out of a space-age medieval fantasy film. The weather changed drastically from the valley Kozan rests within to the high peaks we were navigating through. The sky darkened, and soon the sound of thunder was rumbling the ground beneath us. Jagged flashes of lightening lit up the sky which seemed to literally open up and pour water down on the tiny microbus we were in. The road was entirely desolate. For up to an hour at a time, no houses or humans appeared. Then, out of nowhere, a figure would be standing by the road, the driver would pull over and hand him or her a package, and then drive off. I wondered where these people lived. Only towards the very end of our journey did we see anything resembling a village, though we kept passing signs marking the boundaries of municipal districts. I figured that Seimbeyli must be a regional town, and the smaller village at the approach was the beginning of some kind of increasing density. I was mistaken. When we pulled up to Seimbeyli, the driver indicating it was his last stop. Though it was a small town with only a few streets, everyone who lived there seemed to be outside, and it had kind of a bustling feel, especially in comparison to the vast emptiness we had just driven through. We got off the bus, and I quickly turned to the driver as he was unloading the passengers’ belongings and asked him when the next bus back to Kozan would be. He laughed and said “tomorrow.” I thought I misunderstood him. I looked up the word, and asked again, “tomorrow”? He said evet, yes. I was stunned. I had distinctly asked several people at the bus station in Kozan if there was a return bus that day. I either didn’t ask properly, or I misunderstood their reply somehow. Or maybe they just said “yes” to make it easier on themselves. I prefer to think it was my fault, as I can’t imagine any such deliberate act of ill-will to a complete stranger. With no way back to Kozan, we were stranded for the night. There were clearly no hotels or hostels in this tiny village, so I started to panic a little. I walked up to a group of men sitting in front of a garage and asked them if there was some kind of taxi in town. They all said no, they didn’t think so, but called over to a man standing on a balcony nearby. Out of nowhere, a little 11 year old boy came running over to us and introduced himself, in quite good English, as Brok. He said “you want a taxi?” and then darted about, with us trailing behind, asking all the adults standing nearby if they could help us. Finally, one man called someone he knew in town who owned a car, and asked if he could lend it to another guy who had time to drive us to Kozan and back if we agreed to pay him $70. Not only was it our only option, but I figured it was really a decent price for such a long journey. We only had a few minutes in Seimbeyli after all. Soon after all the phone calls, the driver in question pulled up in a beat up little white Fiat. I was sad to leave so quickly, but our driver told us that we would probably miss our bus in Kozan if we lingered any longer (we still needed to get all the way back to our hotel in Adana). Before we left, we said goodbye to Brok who said we should come to Seimbeyli again because “it is small, but beautiful.” I told him I agreed. Luckily, traveling back by car to Kozan took under 2 hours, this was including a tea break at a little isolated roadside café and rest area. Our driver was incredibly friendly, and we somehow were able to have a broken conversation. He insisted on paying for our tea and asked if we were hungry. He was a soldier, he explained, and a “papa.” He showed us photographs of his wife and 2-year-old son on his cell phone. He then asked if we had facebook and gave us his email address. He had lived in Seimbeyli his whole life, and asked us if we had come to visit the “castle ruins” on the hill. He said it was a shame that we didn’t get to climb up there, it was a beautiful sight. As we pulled into Kozan, we didn’t have much cash left after paying the driver, so we asked him to pull over whenever he saw a bank or ATM. There seemed to be only two on the main road, neither of which would take our cards. Amazingly, he had telephoned someone he knew at the Kozan bus station who told him we had better hurry, they were holding the bus for us. As we pulled up, we gave the driver whatever bills we had (a bit short of proper fare), and the bus driver actually agreed to take us on board anyway. Grateful for all of the wonderful hospitality, and exhausted after hours of travel, I fell asleep on the bus all the way back to Adana. Despite the fact that bus trips were long, they were surprisingly pleasant in Turkey. Most of the buses, even many of the tiny microbuses, were air-conditioned. The driver would bring along bottles of water which his helper, usually a young man, or sometimes boy (his son? Some other relative?) would pass out to passengers. Occasionally, this same helper would walk around with colognia, a kind of lemon-scented liquid that you put on your hands. I thought it was all very pleasant, and completely lacking in any long-distance bus trip experience I’ve had in the US. I recorded this audio track while heading out of Antakya to Gaziantep on a bus that was stopping in Marash. You’ll hear a young man calling out destinations ahead. 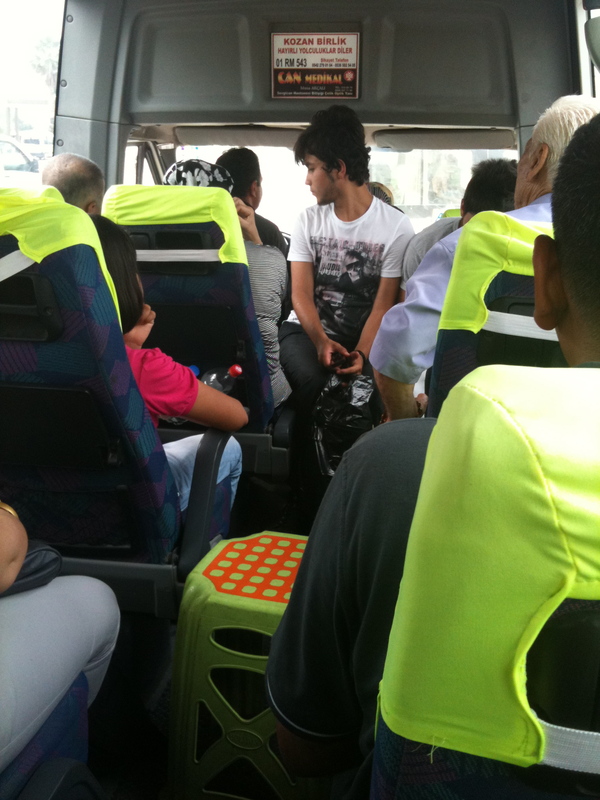 This entry was posted in Lebanon, Turkey, Uncategorized and tagged transportation and destinations. Bookmark the permalink.